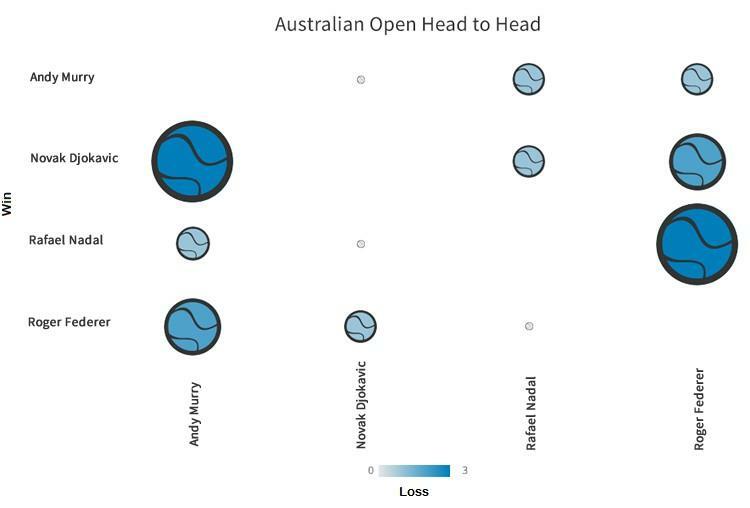 Data visualization predicts the Australian Open champion? Kick starting the Grand Slam tour, the Australian Open always promises to be a scintillating opening to the professional tennis calendar. This year is no exception, with the tournament heating up Down Under, as the games’ best talent battle it out to take home a share of $36 million (AUD) – not bad for two weeks of work. “The Big Four” – Novak Djokovic, Roger Federer, Rafael Nadal and Andy Murray – have been mesmerizing the crowds of Melbourne, cruising through to the third round of competition. The only thing we love doing more than watching these “freaks” of the sport play, is watching them play one another. As The Joker (no, not Novak) remarked in Christopher Nolan’s The Dark Knight, it’s like witnessing what happens when “an unstoppable force meets and immovable object”. This Clash of the Titians (thank you, Louis Leterrier) has been continuing for years. So what will happen if they battle it out once again at the pointy end of the Australian Open? This is a question that has been stumping punters time after time. Due to the unpredictability of such fierce rivalries, it’s probably every gamblers dream to travel to the future and find a Sports Almanac, containing all major sporting results in recent history. 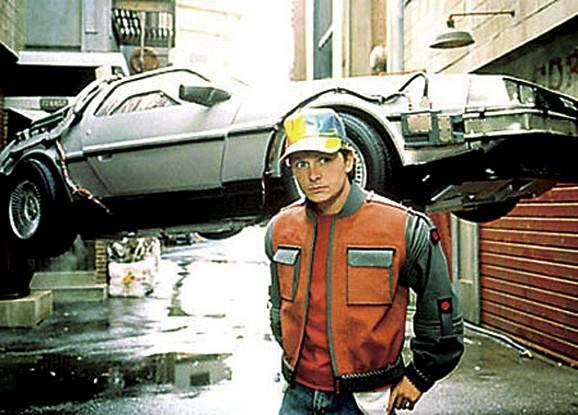 But, most of us aren’t as fortunate as Marty Mcfly. Sadly, we still haven’t invented time travel, and we can’t return back from the future to make a ridiculous fortune on sports betting. But, there might still be some hope…. It’s no 1980s DeLorean, but we can utilize the power of data visualization and Business Intelligence to help us separate the Big Four, and maybe even pick a winner at this year’s Australian Open. The Big Four have dominated tennis headlines over the last decade. The Grand Slam tour acts as a platform for them to truly assert their dominance on the world stage. So who will stand up and take the prize at the Australian Open? Both Djokovic and Federer have the most successful records at the Australian Open, with four titles apiece. Surprisingly, Nadal, who has a total of 14 Grand Slam titles, has only claimed a single title at Melbourne’s premier tennis event. Similarly, British number one, Andy Murray, has been runner-up at the 2010, 2011 and 2013 Australian Opens, but has failed to take out the title to date. So what, or who, keeps stopping the likes of Nadal and Murray from achieving greater success at the Australian Open? Head-to-head: Who will you back? 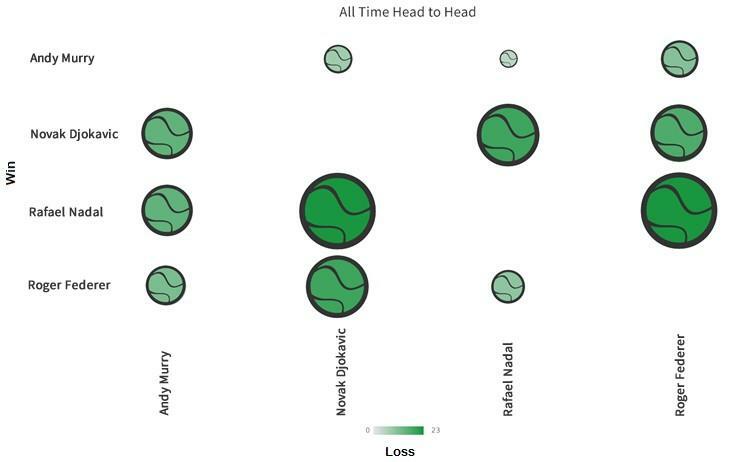 The tennis world’s Big Four rivalry is one of most highly competitive enmities in world sport. So what happens when they do come up against each other? Does one of these four champions ‘have the wood’ over another? Looking at their all time head-to-head records, we noticed some interesting trends. Andy Murray has the weakest record out of the four. When playing the other three tennis mainstays, his best head-to-head record comes against the gradually fading Federer – and even then Federer leads 12 – 11. Djokovic and Federer have a healthy rivalry, with neither one having clear dominance over the other (19 – 17, Federer’s way). The evenness of this rivalry is also reflected in the fact that they share the highest number of Australian Open wins out of the Big Four. On the other hand, Nadal loves a tough fight, and boasts the best head-to-head record, of any player, against Djokovic (23 – 19), Federer (23 – 10) and Murray (15 – 5). So given this favorable career comparison, why has he struggled to find glory at the Australian Open? Let’s take a look at the Big Four’s head-to-head record at Melbourne Park in an attempt to find some answers. Interestingly, Nadal has remained unbeaten by Federer at the Australian Open, overcoming the Swiss champ in their three meetings to date. So who, then, keeps stopping him from grasping that allusive second title Down Under? With Djokovic and Murray only beating Nadal once each, why does he keep losing to lesser-lights at the Australian Open? Potentially demonstrating this comparative vulnerability to lower ranked players on the professional tennis circuit, was the Spaniard’s shock loss to Aussie wonder boy (wildcard), Nick Kyrgios’, at Wimbledon 2014. What’s immediately clear is that Djokovic is Murray’s major stumbling block at the year’s first Grand Slam. In their four encounters at the tournament, Djokovic remains undefeated. Speaking of Djokovic, the strong-minded Serbian has a narrow head-to-head lead over Murray, Nadal and Federer at the Australian Open. So, aside from Djokovic’s strong showings against his three counterparts, what other defining characteristic could punters use to help place their bets at the Australian Open? Can’t take the heat Down Under? The Australian Open, held during the peak of the Aussie summer, is renowned for sweltering conditions. This hostile environment could pose a serious barrier to those competitors from colder climates. But does the heat halt the Big Four? Plotting the average temperature over the duration of each tournament – along with the winners of the Australian Open – for the last decade, we can make some temperature-victor comparisons (and see that the only two years where the Big Four didn’t triumph were 2005 and 2014!). If climate counts for anything, Federer seems to be most accustomed to Australian conditions, winning his four titles in temperatures ranging from as low as 25°C to as high as 31°C. 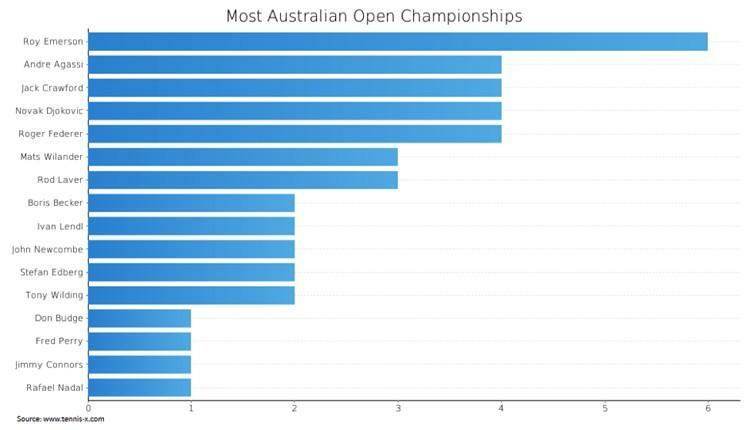 At this point, it’s also interesting to note that, besides his first title in 2004, Federer has only ever won the Australian Open as the tournament’s top seed. As the second seed in 2015, can he break this pattern? Nadal’s one victory was achieved in the highest recorded average tournament temperature over the last decade. With imminent fears of global warming on the horizon, will another scorching Australian summer also mean a second title for Nadal? Despite Nadal’s record, current world number one, Djokovic, also thrives in the heat. All four of his Australian Open titles were won with average tournament temperatures in the high 20s. When it comes to sport and winning, we all have our own superstitions. And, when it comes to betting on sport, it’s no different – picking apart every nuance and possible component of the sport in order to make some quick cash. To predict the outcome. So are we any closer to predicting a winner at this year’s Australian Open? At a glance, it looks like the number one seed, Djokovic, will be assuming the thrown at Rod Laver Arena once more. But could a small, unforeseen, spike (or drop) in temperatures, or Nadal’s strong head-to-head record (23 – 19 overall), derail Djokovic? Either way, our head-to-head comparisons, and perhaps somewhat fanciful temperature-related analysis, seem a bit more reliable than Doc’s plutonium-powered flux capacitor. After all, we wouldn’t want to risk the space-time continuum, and cause irreparable damage to the future, would we?